Where to start in HEMA is a question I often get. Today's article will provide some generic help in getting started, from who to start with, what source to use, what gear to buy, where to train and how to grow your club. When starting out, it can be quite daunting. However, to really get going you only need one other person to train with. Asking your friends is a good start, but if none of them are interested, then you will need to use online resources. If there isn't a nearby group, or if they are not studying something you are interested in, then social media is the way to go. Craigslist is a way you can post an interest in HEMA, as is your Facebook status. While your friends might not be interested, your Facebook circle may reach out to a friend of a friend who is. Finding your first member, someone who will likely be your co-founder as much as a student is a daunting task! After the group I was part of aged out and scattered to the four winds, it was only a chance encounter at an RPG session that I found someone interested .John Patterson answered our RPG gaming request on a website and during the game I asked, "Do you like swords?" A few years later and we have a very large and successful club! The larger area you are in, the easier this is. If you live in a smaller community, make contact with community colleges and see if they will let you advertise around campus. 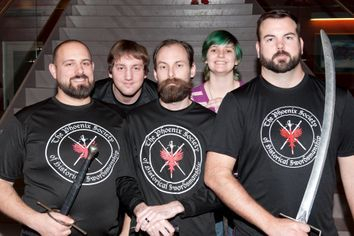 One of the members of my club, the Phoenix Society of Historical Swordsmanship lives in a small town. He also teaches at the community college there and used that to recruit, and so he has his own chapter of our club! Also, look for various HEMA events in or near your area. Just visiting one of them will put you in touch with people who were once starting out, just like you! Socal Swordfight, Combat Con, Longpoint, Swordsquatch, SERFO, The Phoenix Society events (see us anytime you want!) are just some of the places that host events. What source to use is a little easier to do than find your first student/co-founder. There are many sources available and thanks to Wiktenauer, you don't need to spend any money to start investigating. If Wiktenauer doesn't have the source translated, check Amazon with the name of the master and the weapon, and you might be surprised. More and more HEMA books are being created each year, including translations. Tyrant Industries has the Flower of Battle, for example. Below are some common fields of HEMA to look at, including a few sources to consider. There is much more than what you see here, so feel free to do a bit of research on your own, including talking to members of the HEMA community. Let's be really clear here, below really is just a sampling and I tried to link to free resources when able! I have a lot of friends who have written and translated even more material- so, don't limit yourself, but we all need to get started somewhere! Longsword - A two-handed sword popular from around the 13th to 16th century. Fiore - Fiore was a fencing-master whose system is generically referred to as 'Italian'. His system includes much more than just the longsword. Liechtenauer - Liechtenauer was the founder of what is called KDF, "Kunst des Fechtens' or 'Early German'. Liechtenauer has a zettel which is a poem that is difficult to understand. However, follow up masters, provided glosses which help explain it. 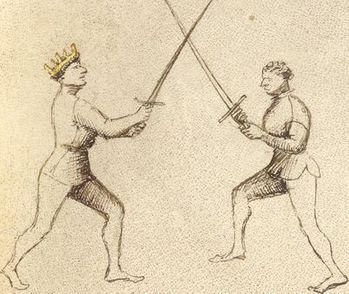 Meyer - Meyer was a later period master who taught the use of the longsword in the 16th century. He used a training sword called a feder and his system includes much more than just the longsword. Rapier - A single-handed, thin bladed sword popular throughout the 17th century. Fabris - Fabris' treatise on rapier is very verbose and covers what to do and what not to do. He is thorough and a good source to understand the many aspects of rapier-play. Giganti - Giganti's treatise is very simple and to the point. His lessons are easy to understand and the core fundamentals of Italian rapier can be learned from him. Bruchius -Bruchius was a mid-period Dutch fencer who was influenced by Fabris and provided concrete, well-illustrated instructions on the use of the rapier. 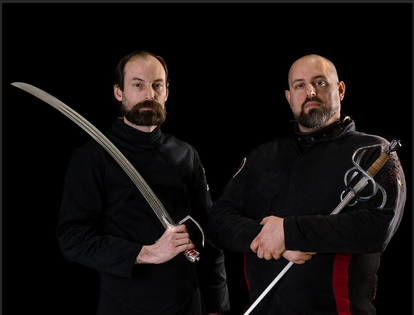 Thibault - A verbose and very different approach to rapier, Thibault taught a system that was similar to the Spanish method of usin g the rapier. Saber- A single-handed, primarily cutting weapon, popular in the 17th century all the way into the 20th! Polish - The Polish of the 17th century used the saber, but so far no direct 17th century instructions exist. However, I took what sources were available to create an interpretation on the evidence we do have. Napoleonic (English) - Military instructions on the use of the saber, on foot and mounted. Simple and easy to understand with illustrations. This is a military treatise, not for dueling. Napoleonic (French) - Military instructions on the use of the saber, on foot and mounted. Well-illustrated and a military treatise, with the use of the small-sword included. Italian - This source contains the history and use of the saber in Italy in the 19th century referencing several sources and a look at Radellian saber. Starting gear is always a challenge, partially because the community changes so often. However, below are a sampling of easy-to-get items that will likely be useful for anyone just starting out. As with sources, there is a lot of gear available and below is just for those getting started, I used a collection of vendors and if you check their pages out, you'll see even more options. You may not need everything below when you get started, so read carefully. Cup - A must have for boys! Elbow pads and knee pads - Always useful. Knee and shin pads - Always useful. There is more elite gear out there though, so this is just a start! Chest Protector - A must have for girls! Heavier Sparring Jacket - Good for longsword. Fighting Pants - Wear this along with tall socks of your budding club's colors. Throat Protector - Always a good idea even though helmets have bibs and jackets sometimes have collars. Helmet with Back of the Head Protection - A must have, and also very durable for long-term use. Light Gloves - Good for rapier and sabers with good hand-guards. Heavy Gloves - Good for longsword. Synthetic Longsword - A good starter for people. Steel Longsword - A good feder that is great way to move into steel. Darkwood Rapier - There's no 'good' cheap rapiers that I've handled, but these work well for me and have for years. Synthetic Saber - This one handles very nice! Steel Saber - I get mine custom made at great prices from SGT. Simply tell Garth you're a friend of Richard's, and you want some sample images of his past work. Rubber Blunts - I use these on the end of my rapiers and tape them on. For shoes, wrestling shoes are my particular favorite, and you should try your local store for those! wearing a collection of the gear listed above. When starting out, you may be very limited in where you can train. Many of the large clubs today started off in someone's backyard. Mine started out in my carport, then I had a concrete pad built in the backyard then we moved to a public park and eventually started renting space out from a gym that could handle our needs. Start small! At your house or a public park. If weather is an issue, then you may try to rent space at the YMCA or a local gym (make sure the ceilings are very high!). You may also have to invest cash. John and I bankrolled the club for some time, then moved to donations and finally dues. 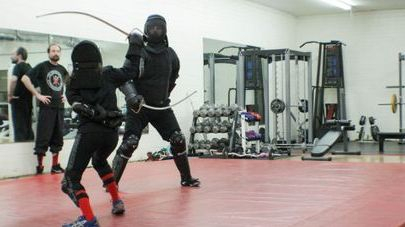 I have many other articles on teaching HEMA including the business of it that you can check out here. Demos are a way to get exposure and you can contact libraries and comi-con style conventions, as well as the Highland Games and any cultural center that ties into the art you are studying. We have picked up the occasional member from these and become better at advertising HEMA as a whole. Consider joining the HEMA Alliance, once you have enough members you can become an Affiliate and Alliance members get discounts to many vendors and events. Also, you can have your Affiliate listed on the club finder. Growth will be sporadic, but if you have a consistent schedule of meeting, and encourage people to help grow the club, in no time, two members can turn into 20. The Phoenix Society of Historical Swordsmanship has been growing since around 2010 when John and I started in my carport. Today, we have our own indoors space, a lot more members, and hope that we can help YOU get into HEMA. Consider checking out the nonprofit organization we are part of.